The Goodwill Theatre/Schorr Family Firehouse Stage in Johnson City is now better prepared to respond to a heart attack [or sudden cardiac arrest event] by one of its patrons or performers. 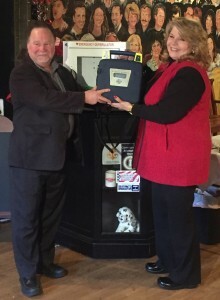 The John Mack Foundation donated an automated external defibrillator, or AED, to the performing arts center Wednesday [12/9/2015]. The AED can restart the heart of someone undergoing cardiac arrest and comes with simple voice prompts to guide the user. John Mack was a 17 year-old Binghamton High School student who died in 2006 when he was struck in the chest by a stick during a lacrosse club match. The facility where the game took place did not have an AED and it took 19 minutes for an emergency crew to arrive at which point Mack was already brain dead. The foundation holds an annual winter indoor lacrosse tournament to raise money to provide defibrillators to non-profit organizations. John’s uncle Rob is president of the foundation. “We have a waiting list. We have 12 organizations right now on our waiting list. And until the tournament in February, I can’t help those folks. And that bothers me more than anything in the world when I have needy organizations and I can’t supply a unit,” said Rob Mack. You can donate to the cause or apply for one of the AED’s at JohnMackFoundation.org. The foundation has donated almost 100 defibrillators since its start. Meanwhile, Goodwill staff will be receiving AED training through the Union Volunteer Emergency Squad. The Goodwill Theatre also announced the AED donation on their website.